I thought it'd be useful to talk here about similar games, for reference but also to help familiarize those who haven't gotten into them before. What did NOT work: cyan and magenta. Guys, check out Floor 13! Has some cool dirty dealings and intrigue in it that I really like. In particular, the sense that you're one step ahead of a scandal or dealing with a suspect effectively felt really satisfying. Cool! I'll check it out. ! Floor 13 is the game that immediately came to mind when you gave the pitch. However, it tended to get confused by its own complexity. I don't know how much you played it, but a number of its "missions" fall apart in a tangled web and don't go anywhere -- hard to say if it's bugs or just odd design. For example, you'll order a hit on a guy, and he'll get away, but then you don't hear anything from him and it all sort of trails off with tons of loose ends and no definite conclusion. It also has a habit of providing only negative feedback, and the game becomes about avoiding negative feedback rather than gaining positive feedback. You're basically trying to avoid "failure" the whole game, rather than actually succeed at anything. However, something Floor 13 did very very well is factions and VIPs. Dear Leader NEEDS a "faction" dossier. It NEEDS a "VIP" dossier. I loved uncovering new factions, reading about their interactions with each other, and working to "infiltrate," discredit, or destroy them. You need need need need the Floor 13 faction/VIP stuff. Need need need. Be very careful with Crusader Kings, the game lasts forever and ever. That and it takes a while to learn exactly how to play. You might be better off checking out Let's Play's of Crusader Kings. It's obviously a very different kind of game in terms of game play but what did people like or dislike about Tropico? I think it's probably useful as a checklist for tropes and character types and the way that it thinly reskins the real world if nothing else. I think the edicts system in Tropico is certainly a good source of ideas, creating secret police, abducting known leaders of opposition groups, or the more positive like Food for the People (which might require you've already issued something about growing the agriculture infrastructure as mentioned in the pitch yesterday) Perhaps some good jumping off points at least. Great reference material! I especially liked Hidden Agenda. Floor 13 had cool ideas on how to, um, manage undesirable parties. 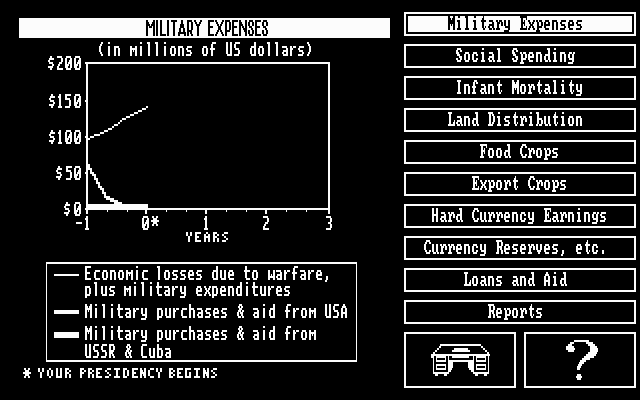 One that comes to my mind is KGB / Conspiracy, which was a grim, though compelling game, made tricky through its use of real-time (as in The Last Express, but to a far less developed express). I never completed it, but came back to it several times due to its singular atmosphere and intrigue. It had a plot that revolved around snuff films, so could be quite a queasy experience to play. The whole thing felt appropriately ugly and oppressive. Oh, wow, KGB! Completely forgot about it. I am pretty sure my friend and I completed it together back when I lived in Russia (no multiplayer in those days but it was fun playing games, especially adventure games, together on one PC). There is the web based game, Nation States, where your decisions effect your country. While it is a bit simplistic in its nature, its fun to see some of the choices you can make and possibly ally yourself with other nations so people don't attack you. This game is HIGHLY excellent. A couple of games a bit tangentially related to Dear Leader that I've been thinking of recently are Balance of Power and King of Dragon Pass. Both games place you as a leader (nation and tribe respectively) of men, with various advisers suggesting various courses of action for any decisions. Both games are stats heavy and more clearly adversarial than Dear Leader is likely to be, but I do think both games, especially King of Dragon Pass are worth a look when it comes to their mechanics. It's probably obvious but for the sake of completeness, here are two screenshots of Democracy 3 that has a very different interface but can probably inspire the simulation part. I think Anna actually mentioned King of Dragon Pass in one of the streams. Excellent game, btw. It really feels like you're leading an ancient tribe and recreating old myths.